It’s no surprise that I adore making roasted vegetables, so these simple and delicious roasted carrot and parsnip fries should come as no surprise! 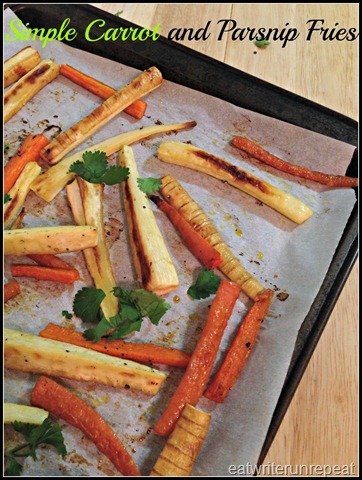 I’ve only recently begun to eat parsnips and so far the only way I’ve prepared them is roasted, although I’ve heard they are great mashed or boiled as well. (Although I can’t tell you the last time I actually boiled vegetables. Yuck. Why boil when you can roast?!) Anyway. Parsnips are quite similar in taste and character to carrots, although to be honest I find them to have a slightly spicy taste to them, whereas wikipedia claims they are sweeter than carrots. 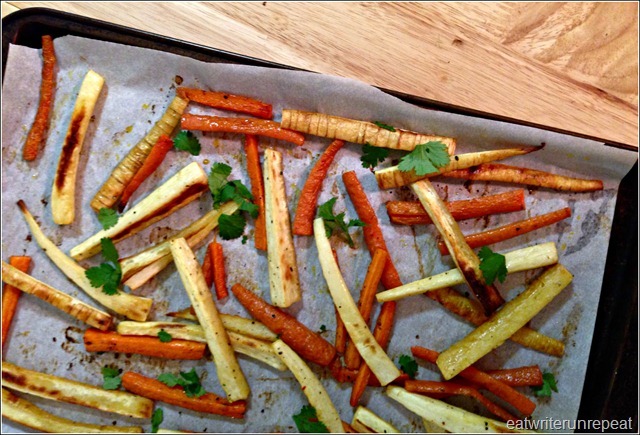 Either way the blending of the parsnips and carrots combines nicely to give you a different take on regular old fries! Just don’t eat them expecting a french fry. 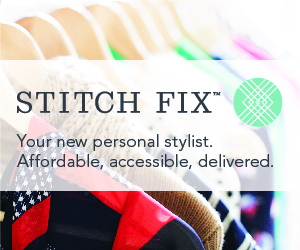 You’ll be disappointed. I think a big reason why I love roasted vegetables so much is that are essentially idiot proof. It seems like no matter how often I think I overcook them they still taste incredible – and trust me, some of my roasted veggies have come out on the darker side. But as long as they aren’t completely charred, the roasting process adds a delicious almost caramel-y flavor to the veggies! And speaking of caramel, I tend to keep these simple as far as seasonings are concerned – just some salt, pepper and paprika (my standard roasted vegetable seasoning), but I can imagine if you have a sweet tooth these would taste incredible sprinkled with some cinnamon, nutmeg, or maybe even a hint of brown sugar if you’re into that. My favorite way to serve roasted carrots and parsnips is with something like steak or maybe even lamb – for whatever reason I think they pair well with red meat. Still these are so versatile you can eat them with just about anything…or you can eat them by themselves and call it dinner, which I may or may not have done the day I made these. Preheat oven to 375. In a bowl, combine your carrots and parsnips with enough oil to lightly coat, about 2 tablespoons for the amounts above. You can either add the salt and pepper and paprika now and combine, or you can wait and sprinkle the seasonings on them once they are on the baking sheet. 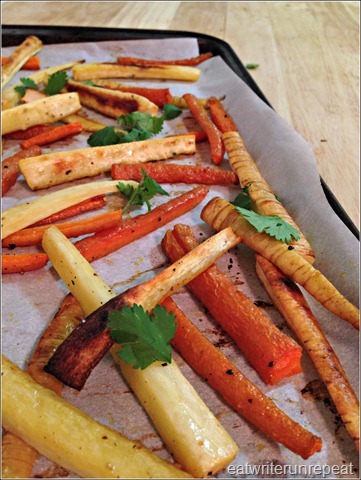 Line a baking sheet with aluminum foil and spread the vegetables down in a single layer. Roast for about 30 minutes or until browned, turning occasionally. 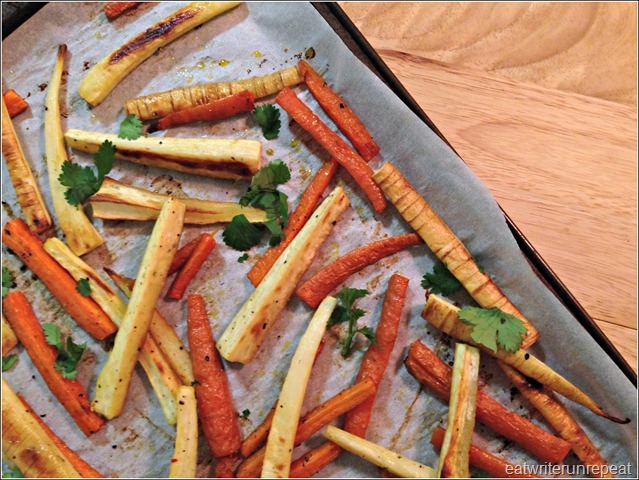 Posted on 1 March 2014 10 October 2015 by BeePosted in Paleo, Side Dishes, Veggies, Whole 30, Winter RecipesTagged carrots, paleo, parsnips, roasted vegetables, Whole30, winter recipes.